Naturalmat have introduced a new organic lambswool pillow designed especially for mums-to-be. They’ve been helping babies and grownups sleep better since launching their first natural fibre mattress in 2001. Their new Pregnancy and Feeding Pillow is handmade in Devon with organic Westcountry lambswool which is sourced from local farms. Wool is amazing at regulating body temperature as the fibres naturally wick heat and moisture away from the body when it’s warm and when it is cool, they keep the heat in. This helps pregnant mums sleep comfortably all-night long in all seasons. 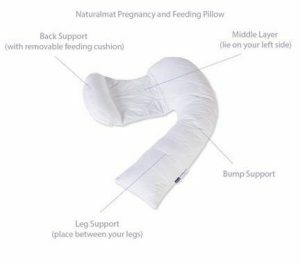 The Naturalmat Pregnancy and Feeding Pillow has a unique 2-in-1 design meaning it can be used first as a pregnancy pillow to support mums-to-be, and when the baby is born, the back support can be removed to provide a handy feeding pillow providing longevity of use. A pregnancy pillow has become a must-have for expectant mums, especially in their third trimester. 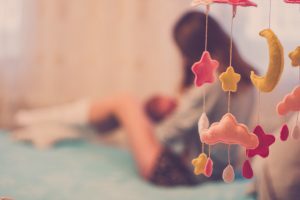 Many women find sleeping on their back uncomfortable at this stage as the weight of the baby puts pressure on other organs in the body. Studies have also shown that sleeping on your left side is best for pregnancy and the American Pregnancy Association, recommend pregnant women sleep on their left side as this will increase the amount of blood and nutrients that reach the placenta. The specially shaped Naturalmat Pregnancy and Feeding Pillow is designed to support mums-to-be to sleep comfortably on their side. It has a centre panel that sits under the torso, a leg support that is placed between the legs with a bump support in the front and a back support at the rear. The pure cotton cover and organic lambswool is naturally hypoallergenic with no added chemicals for healthy bedtimes. The pure lambswool filling with a quilted cover is soft and supportive as your bump grows. It is easy to clean, simply place in a washing machine and wash at 40 degrees then leave to air dry. When your baby arrives, you can unzip the back-support pocket to release a small shaped pillow that can be using for nursing and feeding. With the same breathable lambswool filling, this pillow offers support to both mum and baby keeping you both comfortable during feeding. The Naturalmat Pregnancy and Feeding Pillow is available to order now and each one is handmade especially for you.